As a physician, your time is valuable. In addition to seeing patients, you may head an entire department, or manage your own medical practice; you may even be responsible for staff scheduling, a complex task that can take hours away from an already-busy work schedule. Whether physicians manage staff scheduling personally, or delegate the task to an administrator, the effects of poor scheduling can have a huge impact on patient outcomes. According to data from NSI Nursing Solutions’ 2016 National Healthcare Retention and RN Staffing Report, nearly 82 percent of medical organizations said employee retention is a primary focus; however, only about half of those organizations have a formal plan to mitigate turnover. According to the same report, replacing a single nurse can cost 1 to 1.5 times the salary of the employee. As a physician, your focus should be on helping patients, and yet, the financial burden of high turnover can significantly impact health programs, treatment options, and ultimately patient outcomes. Aside from financial burdens, high turnover rates may also negatively impact continuity of care and employee workloads, and spur countless scheduling conflicts. These factors combined make it difficult to attract experienced talent to a practice, which leads to more turnover, greater costs to the organization, and less effective programs for patients. In short, scheduling is an enormous part of producing positive patient results. Patients rely on the aptitude of your staff, so reducing staff turnover is essential to creating a healthy environment for both employees and their patients. To successfully address employee turnover, physicians should seek to understand the contributions and needs of individual employees, establish policies that promote fair and equal treatment, and overcome scheduling challenges with innovation and integrity. We believe the key to successful employee scheduling begins with the employees—a bottom-up approach to staff scheduling. First, let’s dive into why effective scheduling is important to employees, and why patient satisfaction is dependent on an experienced and optimistic staff. You know the saying, It’s the little things that count? Well, in our experience, it’s true, especially with regard to employee scheduling. It’s easy to overlook scheduling, especially when critical matters of patient care are on the line. But sometimes it’s the little things that can make noticeable differences; and in this case, providing employees with timely and responsive scheduling tools is as relevant to patient satisfaction as the quality treatments they receive from their physicians. Here’s a closer look at how effective employee scheduling impacts three key points in your practice: productivity, work environment, and patient outcomes. Productivity can be measured in numerous ways, whether it be number of patients seen or the quality of an individual patients’ care. In the digital age, we’ve seen tremendous growth in productivity, thanks to mobile technology and digitalization of records, which make it easier to communicate with all relevant parties. How can employee scheduling best utilize these advancements? Scheduling platforms that offer mobile options for employees have been proven to help increase productivity. Because employees are able to access their schedules whenever and wherever they want, they’re more likely to stay connected and communicate with other employees, which makes for better use of time on and off the clock. When scheduling becomes a less demanding task, regardless of the number of employees, practice capacity increases. When employees enjoy more freedom to determine, adjust, and even trade schedules, they’re more likely to show up to work rested, prepared, and capable of performing their duties. Respecting an employee’s personal time, as well as the time spent working for the practice, is advantageous for everyone; the employee has more flexibility and clearer expectations about when and where he’s expected to perform his duties, and the practice benefits from greater productivity and happier, more reliable employees. The morale exhibited by employees is connected to their dispositions about the work environment. Employees that feel respected and appreciated are more likely to perform their duties in a manner than is beneficial to the practice and other employees. Increased communication between team members and less clinical frustration, which in turn helps physicians focus on more important matters such as care of patients. Better scheduling tools and practices enable employees to be more organized. Organization is much easier to achieve when employees are rested, happy, and reliable. Employees can achieve these things if they’re given the opportunity to review and manage their individual schedules on time, and in a format that fits their lifestyles. It’s also much cheaper to rely on effective scheduling software than it is to rely on the scheduling efforts of humans. Solid scheduling keeps costs down and ensures staff stays organized, allowing a practice to operate according to a budget. Additionally, bad scheduling can be expensive, as well as legally disruptive. Effective scheduling helps a practice comply with labor laws effortlessly. When you combine positive workforce morale with reduced clinical frustration, greater organization, and increased productivity, the end result is a better work environment for everyone. And when people feel good about the work being done, they’re more likely to remain employed. Having a seasoned, professional staff who understand the unique values and challenges of a particular practice is invaluable to daily operations. Therefore, effective scheduling bolsters employee retention. Finally, employees have complex lives, family matters, and personal expectations that make scheduling challenging for a single individual to manage. What is often much easier, more efficient, and cost saving is allowing employees to work together to resolve complex scheduling situations with software that allows them to communicate anytime and anywhere. This reduces notions of favoritism, and puts the responsibility of scheduling in the hands of those it affects most: the employees. While positive morale and improved productivity are significant on their own, they also have the greatest potential to improve the most important aspect of your practice: patient outcomes. Wait times are shortened, thereby increasing work productivity. The continuity of care patients receive is more unified, which helps improve patient satisfaction. This ultimately drives longer, more meaningful relationships between the practice and the people it’s there to serve. And when patients are more satisfied with their care, they’re more likely to participate in the programs, treatments, and medical advice given to them by clinicians. This means better care and better results. This is why the little things matter. If clinicians are able to provide more effective scheduling for their employees, a seemingly insignificant detail in the grand scheme of your business operations, your patients will actually be the ones who stand to benefit the most. In short, when patients succeed, the practice succeeds. And when the practice succeeds, employees benefit, too. Tackling effective employee scheduling is a worthwhile endeavor that could change the entire landscape of your work environment and workforce morale. Don’t let something small stand in your way of becoming an exceptional resource for your patients. Make scheduling a top priority, and you’ll reap the benefits. Part of maintaining a positive work environment is establishing clear policies for a variety of scheduling matters. The Fair Labor Standards Act (FLSA), a 1938 congressional proposal that historically adopted the 40-hour work week and established a minimum wage, extra compensation for overtime, and other labor entitlements, helps to guide most of these policies today. According to the United States Department of Labor, FLSA does not require payment for time not worked, such as vacations, sick days, and federal or other holidays. Therefore, these policies are matters of agreement between a physician and employees. Clear scheduling policies help foster positive workplace morale by providing employees with conclusive expectations with regard to personal scheduling matters. Since medical professionals often rely on one another, clear scheduling policies are good for both the individual and the team. In addition to providing employees with definitions of these policies, clinicians should be diligent in enforcing fair and balanced application to ensure every employee receives equal treatment with regard to each policy. To reiterate, vacation policies are the responsibility of physicians, or executive leadership in the organization; they are not mandatory (paid or unpaid) pursuant to FLSA regulation. Fair and balanced vacation policies help promote a positive work environment and incentivize employees to perform well for the practice. Whether you choose to pay employees for their time off or not, vacation policies should have clear definitions and follow a standard protocol when employees request time off. By having a set protocol for requests, an equal number of days per year, and a standard agreement for paid (or not paid) vacation, clinicians will avoid notions of favoritism, conflicts between employees, and a host of other internal matters that are of no benefit to the business. Like vacation, paid sick days are not mandatory, according to the FLSA. Again, it is the responsibility of the physician, or executive level management, to define a fair and balanced sick day policy. Everyone gets sick, but it’s especially important in a clinician’s office to practice discretion with regard to sick day policies. While no one should risk coming to work sick, and contaminate an otherwise healthy workplace, it can be hard to incentivize workers to stay home unless they’re guaranteed paid sick days, or some other form of compensation. Sick employees who come to work can be very costly for a business. According to researchers at Cornell University, ill workers on the job could account for up to 60 percent of corporate health costs. Scheduling tools that allow employees to manage their own work schedules easily, including trading shifts when necessary, increase the odds of workers staying home if they’re not feeling well, which is better for everyone. According to the U.S. Department of Labor (DOL), nonexempt workers must be paid overtime pay at a rate of not less than 1.5 times their regular rate of pay after 40 hours of work in a workweek. 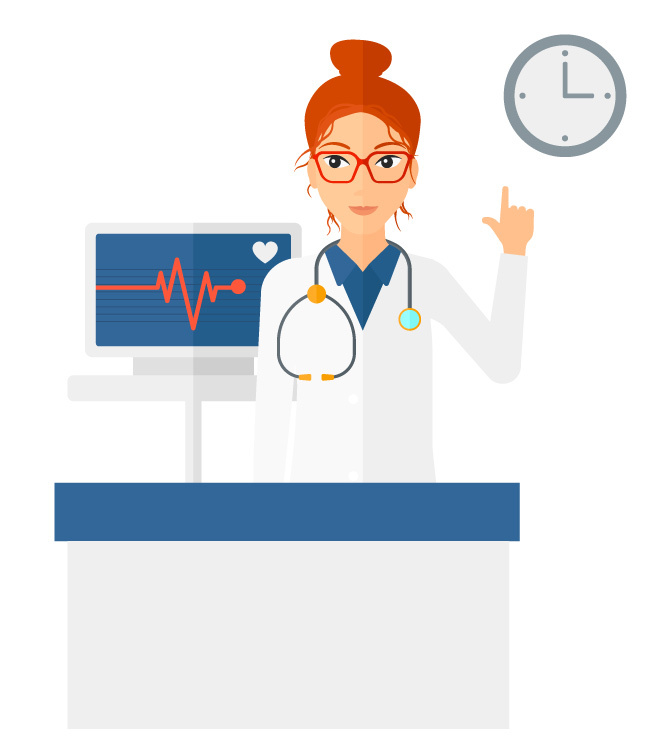 Overtime can be very costly for a physician’s office. While it is mandatory to pay overtime wages, avoiding overtime can be simplified with effective scheduling tools and clear overtime policies. However, overtime can be a useful tool in some cases. For example, it is sometimes easier, and more cost efficient, to build a small amount of overtime into the schedule than it is to hire more qualified staff to avoid overtime. Overtime can also be a useful tool in attracting better and brighter talent to your practice, as some employees won’t mind working longer if it means extra pay. To avoid employee conflict, and to ensure a positive workplace for all parties, physicians should monitor overall and individual overtime hours. This is very simple to do with automated scheduling software that includes tracking features for overtime. Federal law does not require lunch or coffee breaks; however, each state has unique statues that determine break lengths, compensation rules, and whether employees are required to perform certain duties during a break or not. It is the responsibility of the physician, or management, to comply with state laws that govern break periods and compensation rules. Break periods should be fair and balanced, as with all other scheduling areas, to ensure that employees enjoy equal treatment, and to promote a positive workplace environment. Long-term absences can be a sensitive matter. Long-term absences are generally a result of illness, injury, or mental health problems, and require extra sensitivity when deciding how best to handle the loss of that particular employee’s contribution to the workplace. Long-term absences can also cause tension within an office, if other employees feel slighted by extra work, or suspect the absentee is abusing the policy. First, consult with other employees to determine if the long-term absence will be manageable by the remaining staff or if outside assistance is necessary. Keep in regular contact with the absent employee; ask for information regarding recovery to help determine whether reintegration should be gradual, or all at once..
At-will employees who miss too much work can be removed from their position at any time. However, there are some cases in which it is illegal to fire an employee for long-term absences, including absences protected by the Family and Medical Leave Act (FMLA), the Americans with Disabilities Act (ADA), workers’ compensation laws, or state paid sick leave laws. As a physician, you should be aware of your state’s rules and regulations regarding long-term absences. Knowing your rights as an employer will help you make better decisions for everyone in the office, and protect your practice from employees that might abuse long-term absence policies. FMLA leave is usually unpaid and generally only applies to employers with a minimum of 50 employees. However, there are exceptions to these rules, and it’s illegal to fire or reprimand an employee for taking leave that’s protected under FMLA regulation. Clinicians should be familiar with their organization’s legal obligations and rights regarding FMLA, and aware of how their particular state observes variations pursuant to federal law. When physicians and executive level management are clear on these policies, they’ll be more prepared to mitigate friction should it arise. While there is no mandated maternity/paternity leave at the federal level, there are a few laws that exist to bridge the gaps. For example, some states require a partial wage replacement; some states amend eligibility by reducing the number of employees necessary to qualify; some states offer extra absences that extend longer than 12 weeks. Employers themselves can also bridge the gap. Similar to providing paid vacation days or sick days, many employers choose to offer maternity/paternity leave voluntarily, either partially or fully paid. Employees may enjoy this benefit, which in turn improves retention at the practice. These offerings may also give your practice a competitive advantage in a market where recruiting proves challenging. By providing clear scheduling policies, your employees will benefit from stronger expectations regarding their responsibilities to the practice on and off the clock. Correspondingly, the practice will enjoy improved workplace morale, which ultimately improves quality of care for patients. Moreover, the continuity of that care will improve, as turnover rates are likely to decrease within a harmonious group of employees. Applying policies that work for your business, and work to attract better employees, is the best way to keep the workplace thriving while still providing adequate support for individual employee needs and special circumstances. All of these things can be managed more effectively with scheduling tools that help monitor things like overtime and sick days; but even with effective scheduling tools, overcoming unique schedule challenges can be a daunting task for busy physicians. Managing staff scheduling is an ongoing challenge for every healthcare organization. Even with effective scheduling software, scheduling challenges will inevitably occur. Let’s break down some common obstacles and discuss ways to overcome challenges that won’t compromise positive workplace morale. Scheduling with a lean workforce will always be challenging, as it often results in longer shifts, overtime, and employee burnout. Staff scheduling is often addressed from the top down: instead of the staff coordinating the schedule, a manager or central staffing office is responsible and accountable for employee scheduling, which leaves little room for frontline employees to provide their input. Instead, approach staff scheduling from the bottom up. Your staff will know their preferences better than managers; and the staff will work harder and more positively if it feels empowered to create its own schedule. Even with a limited staff, you can provide a fair and equitable workplace environment. Cross-training employees is a great way to fill holes in scheduling. Cross-training personal adds value to employees, and matches staff with patient needs throughout the entire organization. Prolonged stress and frustration often trigger employee burnout. While burnout is nothing a few days of vacation can’t fix, it’s best to avoid employee burnout before it occurs. Signs of employee burnout include employee tardiness, decreased productivity, absences, and isolation. None of these things contribute to a productive work environment, which is why avoiding employee burnout is critical to your practice. Monitor and reduce overtime among staff members. While overtime may occasionally be necessary, overworking a staff member is a quick way to evoke burnout. Using automated software is a good way to track individual employees who may be working too much overtime. Regularly evaluate staffing levels to ensure all staff members are satisfied with their responsibilities, workload, and their ability to provide quality patient care. Training new staff members is timely and expensive. It’s almost always better to look for ways to find resolutions within the organization, rather than hiring new employees. High employee turnover is common among employees who feel overworked and under-appreciated—sometimes a result of poor scheduling, or undefined scheduling policies. We’ve already stressed how employee turnover impacts an organization’s ability to provide quality care for patients, by both limiting financial resources and the talent attracted to the organization. If there’s one thing to glean from this reiteration, it’s that high employee turnover will be an enormous burden for the individual responsible for staff scheduling. The more turnover, the harder it is to automate a scheduling system that’s fair and balanced. Emergencies happen, so having a plan in place for absentee employees is the best way to mitigate stress or clinician frustration in the event an employee is absent without warning. We recommend a stand-by list, or emergency on-call employees that can be notified quickly in the event an employee is absent. This is something to consider during the hiring process; it may be beneficial to seek out employees with flexible schedules for the sole purpose of creating a stand-by list of experienced staffers that are willing and able to accept a sudden change in their schedules. Absenteeism is less than ideal behavior, but hoping it will never happen isn’t a good way to plan for the possibility. Having a plan in place is the best way to mitigate the burden of an absent employee. As we discussed in the last section, policies and protocols concerning vacation days, overtime, and long-term absences, to name a few, are best served when they’re clear, conclusive, and equitable. In particular, last minute scheduling requests can have a negative impact on both the scheduling process, and the organization at large. Again, we recommend a standard protocol for such requests to mitigate any notions of favoritism or biased scheduling. Scheduling conflicts can be a result of error on both the side of the scheduler and the employee. Accidents happen, and in the event that there’s a scheduling conflict, resolution should be swift, fair, and appropriate. Publishing schedules in advance is a great way to avoid scheduling conflicts before they occur. For example, if an employee is scheduled at two locations on the same day, or if an employee accidentally requested the wrong day off, those errors are easier to catch and remedy if the schedule is produced regularly in advance. Moreover, a protocol for how conflicts are resolved should be as standardized as possible, as well as tracked or monitored to ensure no particular employee is abusing scheduling policies or putting undue burden on the rest of the team. Most permanent workers are skilled, experienced professionals, but that’s not always the case with temporary workers. Scheduling with temporary workers should be used to help increase the productivity of permanent workers, not supplement the work they normally perform. For example, it’s unwise to hire temporary workers to give permanent employees a break, or to allow permanent employees to take simultaneous vacations. Poor performance from temporary workers is never acceptable, but temporary workers will have an easier time understanding your practice, and perform at a higher level, if mixed equally within shifts that include several permanent employees. On-call scheduling refers to when an employee’s work schedule is intentionally unpredictable. Typically, the employee calls in a few hours before a shift starts to find out if he or she is needed. Unlike other industries that practice on-call scheduling, the medical industry has obvious need for this type scheduling, as an emergency can greatly impact an organization’s ability to function adequately without the proper number of staff. Moreover, having the right staff for a particular job is equally important. On-call scheduling is critical because speedier access to other physicians and specialists means faster collaborations, and better overall care. The good news is that on-call scheduling technology has improved over the last few years, making it easy to balance on-call employees with full-time workers. Scheduling for skill level can affect workplace morale for several reasons. First, weighing some shifts heavy with experienced staff, and others with less experienced staff, can greatly reduce continuity of care. Productivity levels may vary between shifts of highly skilled workers, and those of less experienced employees. What’s more, experienced professionals can be tremendous training assets to newer, less experienced employees. Cross training is easier to accomplish when everyone performs at similar levels, but that’s difficult to achieve if all the experienced workers prefer to work exclusively together. It is in the best interest of the practice to mix up experience levels of employees to ensure continuity of care, and to foster better training opportunities for newer staff. Operating within a budget is challenging enough, so wouldn’t it be nice if you could analyze costs (maybe even find ways to save money!) based on staff scheduling? With automated scheduling software, looking at the difference between scheduled hours, and hours actually worked, can be a useful tool in determining whose hours had the most influence on your planned budget. For example, new scheduling technologies allow you to monitor the difference between planned staffing costs and what actually occurred, down to when each employee clocked in and clocked out. Over time, you may notice trends in over-scheduling or under-scheduling specific employees that have the greatest influence on your budget. Finally, physicians themselves have unique scheduling challenges that must be overcome to provide optimal use of the physician’s time and resources. The balance between satisfying physician responsibilities to the organization, and managing the preferences of various providers, is called the Master Physician Scheduling Problem, and it’s a complex task even without the time constraints. For example, the organization may require 24/7 coverage 365 days a year; but the physician prefers to have weekends and holidays off. These types of conflicts are what drive the Master Physician Scheduling Problem. Typically, these conflicts require compromise, but compromise in the medical industry isn’t always the best solution. That’s why most organizations look to maximize overlap in its fulfillment of organizational needs, as well as the individual needs of each physician. One of the easiest ways to ensure overlap is maximized is with automated physician scheduling software, which helps support optimal physician scheduling through advanced technologies that consider all the complexities and various moving parts of an organization’s staffing needs in a single, centralized program. Overcoming common scheduling challenges is possible with the right tools. In addition to overcoming the obstacles mentioned above, we think it’s important to cover some valuable physician scheduling tips that could turn employee scheduling into a valuable insight asset for other areas of your business. Aside from improving patient outcomes, and providing employees with an equitable workplace, some physician scheduling tips can help streamline communication, forecast staffing needs, and improve automation. These things combined help reduces costs in all areas. The frontline of innovative physician scheduling centers on new automated technologies and picking the right software for your organization’s needs. Every organization will have different staffing requirements, communication needs, and various reasons for analyzing scheduling efficiency. Looking at these three key areas will help determine what kind of scheduling software will work best for your organization. For example, do you manage a large staff? Monitoring employee availability can be particularly challenging for a large office; scheduling preferences may change periodically throughout the year. What current systems do you have in place that allow you to monitor employee availability? How do you distribute schedules? Are they provided to employees in advance? Streamlined communication is advantageous for obvious reasons: it reduces clinician frustration, empowers employees to collaborate in the scheduling process, and reduces the occurrence of scheduling errors and challenges. And finally, what can you learn about your practice from the way you currently manage and enforce staff scheduling? Analyzing schedule efficiency is easy with the right software. You can learn more about employee strengths and weaknesses, as well as track monetary concerns like overtime from a single, centralized program. Effective scheduling software can also help forecast upcoming scheduling needs and makes planning for them more manageable. As you might imagine, monitoring employee availability, streamlining communication and analyzing schedule efficiency are all ways to reduce the amount of time spent on scheduling, which is a worthy, cost-saving endeavor for your practice. In some instances, copying schedules from week to week may be all that’s required of you; but in the event that it’s not, instant communication with staff and other team members puts you in control from a centralized location, allowing you to make swift adjustments, or gather insights for future automation goals. Automated rules let you make changes in your software account automatically, based on settings and conditions you choose for your organization’s staffing needs. Common rules may include things like standardized staffing or shift times, a standard number of days off per week, or limits on overtime. Depending on what you wish to accomplish, using rules and automation can help further reduce your costs. Over time, you’ll be able to create and implement various templates for the entire scheduling process. Utilizing templates is a fast way to perform daunting staff scheduling, and a good strategy for saving time and money. Having a standard protocol for requesting days off, or changes to an employee’s schedule helps keep scheduling fair and balanced for everyone. There are lots of reasons a schedule might change throughout the year—kids’ school schedules change, new education or training opportunities arise. It’s in the best interest of the organization to be accommodating. That being said, the employee has a responsibility to give the organization plenty of time to make adjustments to the schedule. Schedule requests should be formal, written requests, reviewed and considered well in advance of when the change needs to be made. Giving employees the freedom to make changes to their schedules is very important, but it’s best to have a standardized way of handling requests to ensure all employees are treated fairly. It may be hard to please everyone with regard to their schedules, but physicians should still try to make adjustments pursuant to staff preferences when and if it’s possible. Again, communication is key. The importance of communication in creating effective schedules cannot be understated. When employees have clear channels of communication with physicians or administrators managing staff scheduling, they’re more likely to provide the organization with information regarding requests, preferences, and changes, in a timely and respectful manner. Finding a balance between what the practice needs to be effective, and providing flexibility to its employees, should be central when considering the staff’s preferences. Like all new things, scheduling software takes some practice, and you shouldn’t expect perfect results right after installation. In fact, it won’t just be you learning how to use new software; you’ll have an entire team learning how to use it, too. By fostering a continual, reinforced learning environment, you can help employees learn over time, and more effectively. Effective onboarding will take time, with lots of concerns and questions along the way. But don’t worry; those are good signs! It means employees are paying attention and want to learn more. Encourage learning on all fronts as an organization, not in silos or departments. Provide help and training to employees that need it; encourage staff members that aren’t struggling with the software to help others. Remember, even after the current staff effectively integrates, new hires will still require training. Encourage a state of continual learning to help mitigate frustration during the onboarding process, and provide channels for new hires to learn software effectively and in a welcoming environment. Intrigma provides easy-to-use tools to simplify physician scheduling and improve communications among medical professionals. In a world that’s become increasingly connected, isn’t it time your scheduling software connected to the people it affects the most? With innovative technologies that lets medical professionals manage their schedules from just about anywhere, Intrigma is leading the way for better, more reliable scheduling that helps physicians and nurses do what they do best. The medical field is a fast and evolving industry that shouldn’t spend more time on scheduling than it has to. We have a responsibility to our patients to do the best we can, which is why effective employee scheduling is so important; we can do better with the right software, and the right policies, and the right attitude with regard to how we treat our employees’ time, on and off the clock. What you need to know about physician scheduling is vast, but what you need to know today is simple: don’t wait to make a change that could revitalize your entire practice or organization. A better way to schedule physicians, nurses, and staff is available, and you’ll find it with Intrigma Scheduling Software.